Tom Voigt of Zodiackiller.com and his associate David Morris have promoted Richard Gaikowski as a "new" Zodiac suspect, and they have also promoted Gaikowski's original accuser Blaine Blaine as a reliable informant. Voigt, Morris and Blaine all appeared in the History Channel documentary MYSTERYQUEST, the first television broadcast to name Richard Gaikowski as a Zodiac suspect. Visitors to Voigt's website, viewers of MYSTERYQUEST, and others who are led to believe that Gaikowski is a "new" suspect and that Blaine is a reliable informant might reach different conclusions after reading the rest of the story. Blaine’s report described his amateur efforts to solve the case as "a systematic investigation" similar to the work of a "scholar." Blaine stated that he had visited the crime scenes and "numerous" libraries, and, he had read newspaper articles and books about the case. According to these letters, Blaine claimed that he first learned that Gaikowski was a serial killer in May 1986 when he had amassed a volume of material on the man in question. Blaine claimed that he had investigated Gaikowski's family, friends, girlfriends and former employers in the South Dakota, although he used the misspelling "Dekota." Blaine also stated that he had secretly recording several telephone conversations with Gaikowski without Gaikowski's consent or knowledge. After amassing this collection of material, Blaine wrote what he described as a 500 page manuscript which detailed in amateur investigation. Blaine stated that Gaikowski had become suspicious of this investigation and threatened Blaine's life. Blaine claimed that Gaikowski had also killed "two people" as a warning. According to this report, Blaine began his investigation immediately after the release of the book ZODIAC, and he used much of the information contained in Graysmith’s book as the foundation for his own work. In less than three months, Blaine had identified the Zodiac as Richard, his former employer at a California newspaper. Blaine claimed that Richard had threatened his life and even killed two people in an effort to silence him; one of the two victims was reportedly a lover of Blaine’s. None of these claims were ever substantiated, and, far from a scholarly work, Blaine’s report was a collection of wild assumptions, rampant speculation, convoluted decipherings, repeated factual errors and more. Blaine based much of his work on erroneous news reports, as well as the stories told by the sisters of Darlene Ferrin, Pam and Linda. Blaine wrote that "it had been established that the Zodiac was specifically involved with [Zodiac victim Darlene Ferrin]," despite the fact that no credible evidence had ever been presented by anyone to support this alleged connection. Blaine apparently believed that the Zodiac crimes "centered" on the killer's alleged relationship with Ferrin. Citing the reports that a man had bothered Ferrin where she worked as a waitress, Blaine claimed that the Zodiac was a specific individual who had visited Ferrin at work during the spring of 1969. Blaine also repeated the unsubstantiated claims that the Zodiac had stalked Ferrin in the months before her death. The stories of a mysterious stalker could be traced to Pam and Linda yet neither sister had ever reported this information to police during the investigation of Darlene’s murder. Blaine, at some point, developed his own information that Richard had known Darlene, and even claimed that an argument between the two had played some part in Richard’s reported 1965 arrest and the subsequent loss of his job. Blaine also believed that the Zodiac’s “Mt. Diablo Code” was the key that revealed the identity of the killer. Blaine’s solution named Darlene Ferrin and Richard Gaikowski as well as Gaikowski's home town of Webster, South Dakota. Like Graysmith, Blaine had written his own book around this theory, titled GOLDCATCHER AND ZODIAC, a title which had apparently confused some people who, as Blaine wrote, mistakenly assumed that he authored a work of fiction because they were, according to Blaine, “lacking in critical perception." Blaine also described the obstacles he faced when asking authorities to seriously consider the “overwhelming” evidence of Richard’s guilt. Blaine also wrote that he had obtained a notebook filled with Gaikowski's handwriting and that the disappearance of these writings may have sparked Gaikowski to kill other people in order to intimidate Blaine and end his amatuer investigation. According to Blaine, Gaikowski fired a gun at Blaine's van and then stated that Blaine was dangerously delusional and should forget about the Zodiac case. The report concluded with Blaine’s plea for help and despair at his current circumstances. At the time that Blaine Blaine was claiming that Richard Gaikowski was the Zodiac, Blaine wrote a letter to Gaikowski in which he stated that he was enclosing the first chapter of his "historic novel" titled Goldcatcher and Zodiac. Blaine stated that he hoped Richard would enjoy reading the chapter and expressed his desire to visit Richard's home in order to watch some films. Blaine asks Richard to send him a written invitation and suggests that the two also have dinner together because Blaine is "always starved." Blaine also wrote that he could not wait to see his former friend. At the top of the page, Blaine had drawn a Zodiac symbol next to Richard's name. Blaine’s decision to mail his manuscript to his suspect, and his friendly tone, strongly suggests that this letter must have been written BEFORE Richard had begun killing people to stop Blaine’s investigation. In 1969, Blaine worked with Richard at a California newspaper, and, according to Blaine, Richard had instructed him to write a message to the Zodiac and told him exactly what words to use. The message then appeared in the newspaper - one of several owned by the same chain that owned one of the three newspapers contacted by the killer. Richard had written extensively about his encounters with local police and subsequent yet brief incarceration for drinking and driving [according to one account, Gaikowski staged the event and was never actually arrested]. Blaine viewed these articles as Richard’s effort to cast suspicion on himself. On August 20, 1986, Blaine wrote a letter to Napa County Sheriff Ken Narlow and Inspector Napoleon Hendrix of the SFPD. Once again, Blaine presented himself as a paranoid and delusional crackpot who had become obsessed with Richard Gaikowski and now viewed authorities as conspirators who were protecting a killer. Blaine wrote that Gaikowski "might" have killed a cab driver Leonard Carl Smith, who was shot to death in his cab in a crime somewhat similar to the Zodiac's last known murder of cabdriver Paul Stine in San Francisco many years earlier. 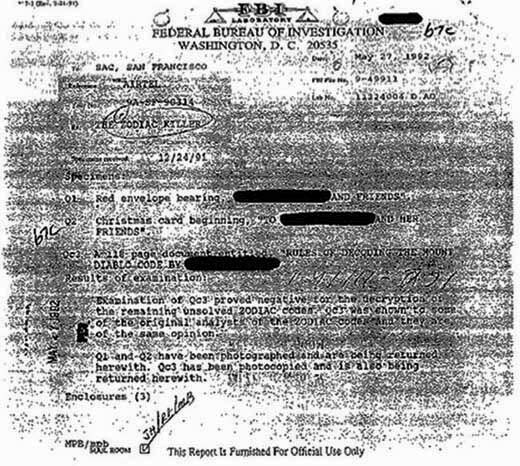 Blaine's letter included a long, tenuous list of theorized connections between Gaikowski and Smith. Blaine also believed that Gaikowski was trying to send messages with this crimes and the subsequent media reports of his evil deeds. 1: Blaine stated that Gaikowski should be arrested for several murders, including the stabbing death of Cecelia Shepard, but, Blaine did not mention or provide any evidence to implicate Gaikowski in these crimes. At best, Blaine’s “evidence” seemed to consist of little more than Gaikowski’s geographic location as it relates to a number of other locations unrelated to the Zodiac case. Further, this “evidence” did little to establish any link between Gaikowski and the murder of the cab driver, Leonard Carl Smith. 2. The fact that law enforcement was not receptive to Blaine’s theory was certainly understandable, given the fact that not once in this entire rambling letter did Blaine cite any credible reason to suspect Gaikowski of any crime, let alone the Zodiac murders. What Blaine did offer, in addition to his convoluted geographic analysis, was the claim that the codes “prove” that Gaikowski was the Zodiac, yet, an examination of Blaine’s deciphered solution proved that Blaine’s solution was invalid. Ken Narlow, and any other reasonably intelligent law enforcement agent, would be forced to conclude that Blaine’s solution and claims had no merit. When a man cannot correctly spell the name of an author whose book he has apparently studied in great depth, and cannot correctly spell the name of a state he claims to have visited, one would be rather foolish to believe that such a person could properly decipher a complex code, let alone do so with the certainty Blaine claimed. 3. In this letter, Blaine wrote that Gaikowski had known certain people. Despite Blaine’s claims, he cited no evidence to even suggest that Gaikowski knew the cab driver Smith, let alone killed him. Any reasonably intelligent agent of law enforcement would have undoubtedly noticed this, and would therefore be forced to conclude that Blaine’s claims had no merit. 4. The “context” to which Blaine referred was obviously nothing more than groundless assumptions. Blaine wrote that he had offered “facts” which, when considered along with his accusation, “lends reasonable support” to his theories. Blaine seemed unaware that he had not offered any facts that accomplished this feat, or, that he had failed to even cite any facts that indicated Gaikowski should even be considered a suspect. According to one account, Ken Narlow decided to “stake-out” Gaikowski’s home for a few nights. Such action is not common, wise, or even standard procedure. The decision to stake-out a suspect’s residence usually follows other avenues of investigation and usually comes only when good reason to suspect the individual has been established. This is not how Narlow and other investigators handled the investigations of other suspects. However, given the nature of the claims made by Blaine that Gaikowski was actively engaged in attempts to intimidate him, and was killing other people in an attempt to do so, Narlow may have believed that a stake-out was warranted because he may have thought that he could catch Gaikowski engaged in some illegal act. Yet, it is difficult to believe that Narlow, an intelligent and professional lawman, would engage in such action without also taking the usual steps when investigating a suspect, i.e. gathering information, checking criminal records and attempting to obtain the suspect’s fingerprints. This was standard procedure - something Narlow usually followed - and the failure to follow this procedure can only be considered baffling at best. By all accounts, this event occurred long after Gaikowski was already aware that Blaine was accusing him of being the Zodiac, long after Gaikowski had allegedly warned him to cease his investigation, and long after Gaikowski had allegedly murdered at least two people in an attempt to intimidate Blaine. Narlow’s decision to stop investigating Gaikowski because the suspect had been “tipped off Gaikowski” makes no sense, given the fact that Gaikowski was already aware that he was suspected. If Narlow had “nothing compelling to begin with,” the decision to stake-out the suspect’s home seems odd, at best. If the surveillance was initiated at the request of Blaine, and based on the alleged threats to Pam, the explanation that the investigation was ended because Pam interfered makes no sense whatsoever, as Pam was already involved, and Gaikowski, if he had, indeed, threatened both Blaine and Pam, had to know that both Blaine and Pam would most likely report the threats, and their suspicions, to authorities. Further, the fact that a suspect has become aware that authorities were investigating him had never deterred law enforcement agents in the past investigations of suspects. Tom Voigt had repeatedly described Pam as a witness who suffered from "severe credibility issues," yet he also repeatedly quoted her as a reliable source when doing so suited his needs and helped to implicate his pet suspects. On April 6, 1987, Blaine fired off another letter; this time, he wrote to Narlow and Fred Shirasago, an agent assigned to the Zodiac case at the California Department of Justice. Based on Blaine’s written statements, both Narlow and Shirasago had been aware of Blaine’s claims for some time. Blaine claimed that Narlow was abusing his authority in order to thwart Blaine's amateur investigation because Narlow was then running as a candidate for sheriff. According to Blaine, Narlow reportedly referred to him as a "goofy person," and, Shirasago called him a "fruitcake." Blaine also claimed that Shirasago had lied to the family of Darlene Ferrin in order to discredit Blaine and his investigation. Blaine specifically stated that Narlow told him that Gaikowski's fingerpints did not match those believed to belong to the Zodiac. According to Blaine, Narlow and Shirasago had shouted at him and treated him with contempt. Blaine also claimed that Narlow fingerprinted him and stated that Blaine was bothering Darlene Ferrin's family and interferring in the Zodiac investigation. Blaine wrote: "What happened next was that Ken Narlow rushed over to Gaikowski’s house, confronting him, taking fingerprints, and hand writing samples, and then cleared him!" According to Blaine's own account, Narlow reportedly stated that Gaikowski had produced a passport with a stamp for London, England in December, 1968, the time of the first suspected Zodiac murders on Lake Herman Road. Gaikowski himself stated in another account that he had been overseas at the time in question. Blaine theorized that Gaikowski's connections to the counter-culture undergound in the Bay Area had somehow provided him with a fake passport used to hide his true travel history. Narlow and Shirasago were not impressed by Blaine's claims and Blaine described this lack of interest as a "major coverup" in which authorities were going to conceal the "whole bloody truth." Blaine respectfully demanded that both Narlow and Shirasago "disqualify" themselves from the investigation and that other, more responsible authorities would launch a new "professional" inquiry into Blaine's claims. 1: Blaine stated that he had given both Narlow and Shirasago “detailed information” regarding Gaikowski which “matched in every detail the Zodiac,” yet, this is clearly not true. None of the information presented by Blaine established any connection between the Zodiac and Gaikowski, and, this information did little to support Blaine’s claim that Gaikowski was the killer. (Note: Blaine wrote: “...Gaikowski, who is the Zodiac...” - a clear indication that he had gone from a man with a theory to a man who was utterly convinced beyond all doubt.) That Narlow and Shirasago were not convinced by this information is perfectly reasonable, despite Blaine’s complaints. 2. Blaine referred to his manuscript, ON ZODIAC’S IDENTITY, as a “detailed, scholarly” work, yet, even a cursory examination of this report proved otherwise. In fact, Blaine’s report clearly demonstrated that, far from an objective and scholarly analysis, his deciphering of the Zodiac’s codes was little more than a convoluted and unconvincing collection of wild assumptions, leaps in logic, unfounded conclusions and subjective analysis. The results did not support Blaine’s theories and, instead, revealed his methods to be more the product of wishful thinking than scholarly examination. That Blaine could refer to this report as “scholarly,” despite its many misspellings and errors, is evidence that Blaine could not see his own work objectively and did not understand that his sloppy and un-scholarly manuscript did little to lend him credibility. 4. Blaine wrote with absolute certainty of his own conclusions as if they were fact and criticized Narlow and Shirasago on many grounds, including the fact that the men were unable to accurately recall information about the case. Yet, in his own letters, Blaine clearly demonstrated that he, himself, suffered from the same affliction. Blaine refered to “Dr. Sherwood Morrill,” yet Morrill had no such title. He refered to Shirasago as a “homicide” investigator and a “detective,” when, in fact, Shirasago was an agent, not a detective. The distinction may seem unimportant, yet, when these simple errors were made by a man claiming to have more knowledge than his law enforcement critics, the errors were magnified by Blaine’s hubris and unjustified righteousness. Blaine also claimed that Shirasago told him that Blaine could not have cracked the Zodiac’s codes because “NASA” was unable to do so. NASA is the National Aeronautics and Space Administration and does not engage in cryptography; the NSA [National Security Agency] was engaged in attempt to decipher the Zodiac’s codes. Again, the distinction may seem small to some, yet Blaine’s attitude of superior knowledge was betrayed by his simple mistakes. Blaine’s writings clearly demonstrated that he was incapable of spelling even the simplest words correctly, further reason to question his claims to have deciphered the Zodiac’s complex coded messages. 5. Blaine claimed that Pam Huckaby (Suennen) had identified Gaikowski, yet he did not provide any context for this identification (i.e. when had Pam seen the man, where, or how). Pam reportedly stated that she and her mother had once driven to Martinez, California to pick up Darlene from the home of a “reporter,” and Blaine clearly believed this man was Gaikowski. Pam further stated that she had received threatening messages of various kinds, and that she and Blaine believed that Gaikowski was responsible. During the course of the last four decades, Pam Huckaby made many unsubstantiated, dubious and false claims regarding a mysterious stranger who had been stalking her sister, Darlene, and repeatedly claimed that she was the victim of repeated harassment from unknown sources, most likely the Zodiac himself. In fact, Blaine’s 1987 report to Narlow contained a supplement, written by Pam, which detailed some these claims. For many years, the claims made by Pam (and her sister, Linda) served to perpetuate the theory that Darlene had known her killer. Blaine himself refers to this “connection” as if it were fact in his manuscript, ON ZODIAC’S IDENTITY. To date, no credible evidence has surfaced to support the theory that Darlene knew her killer, or, that she had been stalked by anyone prior to her death. With the exception of the claims made by Darlene and Linda, no credible evidence exists to suggest that Darlene Ferrin knew the Zodiac. Pam’s claims regarding Darlene’s connection to a reporter in Martinez, and her identification of Gaikowski cannot be considered credible. 6. Blaine’s letter stated that Shirasago told him that an “expert” had concluded that Gaikowski’s handwriting did not match that of the Zodiac, and mentioned a specific sample (a notebook). Few scenarios can be considered plausible: 1) Shirasago was telling the truth, 2) Shirasago was not telling the truth, or 3) Blaine was not telling the truth. If Shirasago was telling the truth, then Gaikowski’s writing was compared to that of the Zodiac and an expert excluded him as a suspect. If Shirasago was not telling the truth, then Gaikowski’s writing was not compared to that of the Zodiac. If Blaine was not telling the truth, then Blaine cannot be considered credible and proved that he was willing to be dishonest in order to suit his needs and cast aspersions on Shirasago. 7. Blaine’s letter also stated that Ken Narlow had, indeed, confronted Gaikowski, taken his fingerpints, obtained samples of his handwriting, and viewed a passport which demonstrated that Gaikowski was not in the United States in December 1968. During previous investigations of suspects, Narlow consistently acted to gather the pertinent information and evidence necessary to properly investigate a suspect, including handwriting and fingerprints. Few scenarios can be considered plausible: 1) Narlow was telling the truth, 2) Narlow was not telling the truth, or, 3) Blaine was not telling the truth. If Narlow was telling the truth, then Gaikowski was excluded using handwriting and fingerprint comparisons. If Narlow was not telling the truth, such evidence was never obtained and no such comparisons took place. If Blaine was not telling the truth, then Blaine cannot be considered credible and proved that he was willing to be dishonest in order to suit his needs and cast aspersions on Shirasago. Today, Blaine’s enablers are quick to reject any version of the story in which anyone ever checked Gaikowski’s fingerprints against those believed to belong to the Zodiac. The claim is that Narlow, himself, said that no fingerprint comparison was ever conducted. Apparently, the story is that Blaine misheard Narlow; a convenient story, to say the least. Fingerprint comparisons were standard procedure when examining Zodiac suspects - except in this case, for reasons unknown. Further denial comes in the explanation that the notebook allegedly belonging to Gaikowski and reportedly compared to the Zodiac’s handwriting may not have belonged to the suspect after all. Tom Voigt offers a story told by Blaine as proof, apparently unaware of the fact that Blaine has no credibility and has already offered several mutually exclusive and contradictory accounts. According to Blaine, Narlow claimed to have seen a passport that indicated that Gaikowski was not in the United States in December 1968. According to Tom Voigt, Gaikowski “allegedly left for Europe in September 1968 ” and was reportedly in Ireland at that time of the murders on Lake Herman Road on December 20, 1968. This information served as a strong indication that Narlow had, in fact, confronted Gaikowski and had actually seen such a passport, as the time frames in question are exact, and it would have been virtually impossible for Narlow to accurately guess that Gaikowski had been out of the United States at that time without such evidence. Recently, Gaikowski’s accusers have dismissed the passport alibi and claim that Gaikowski could have been in the country at the time of the killings. The denial once again relies on Blaine’s account, and a misunderstanding; according to this version, Narlow did not see the passport and only told Blaine that Gaikowski had mentioned his passport as a possible alibi without providing the actual document. 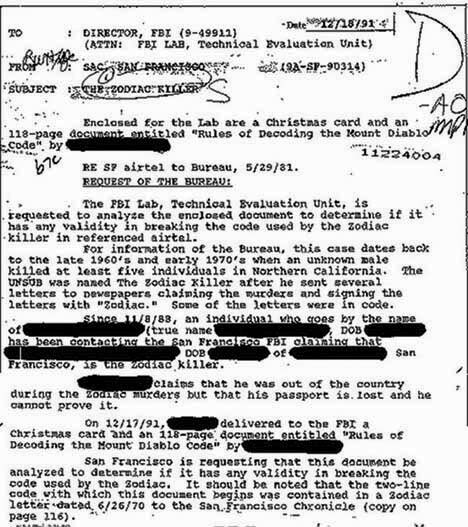 During the recent broadcast of the new History Channel program MYSTERYQUEST, a friend of Gaikowski’s mentioned a letter he had received from the suspect at the time that the Zodiac murders began. According to the friend, this letter indicates that Gaikowski was in Albany, New York, and not in California at the time in question. Most objective observers have already recognized the undeniable fact that no credible evidence implicates Gaikowski in the Zodiac crimes and that the existing information and evidence clearly indicates that he is, at best, a poor suspect. However, these facts have not deterred Gaikowski’s accusers, who will continue to claim that Gaikowski could have been in California at the time of the Zodiac crimes. Another puzzling and possibly exculpatory exhibit was included in the collection of documents pertaining to Richard Gaikowski - a handwriting sample that appeared to have been written for police, or, written in response to the accusation that Gaikowski was the Zodiac. The writing does not appear to be similar to that of the Zodiac, as Narlow and Shirasago allegedly told Blaine handwriting experts had concluded. This sample is similar to another sample linked to Gaikowski. Gaikowski’s chief and only accuser claimed that he was told by at least two law enforcement officials that his suspect was excluded on the basis of handwriting, fingerprints, and even a possible alibi. According to Blaine, Gaikowski confessed that he was, in fact, the Zodiac. This is hardly the behavior of a man determined to discourage Blaine. If anything, such a claim would only serve to further convince Blaine that he was right, and the threats and murders would only serve to compel him to continue in his attempts to get authorities to investigate Gaikowski. Had the suspect wished to truly deter Blaine, Gaikowski could have easily denied any involvement in the crimes and made an effort to appear innocent. Gaikowski’s behavior, as claimed by Blaine, makes no sense if he was guilty; however, his “screaming,” and other behavior, indicates that Gaikowski may have been nothing more than an innocent man who was sick and tired of Blaine’s baseless accusations and wished to put an end to the harassment. According to Blaine, he somehow obtained a book that had been in Gaikowski’s possession. Few details are available concerning the origins and custody of this book, but the story told by Blaine was once again sensational and shocking. Titled PLATO AND PARMENIDES, a popular philosophy text used in college courses, the title page of the book featured a signature , “Paul Stine,” the name of the Zodiac’s last known victim. Blaine has stated that the book did not show any traces of blood. According to Tom Voigt, Blaine contacted SFPD sometime in 2001, and gave this book to an unidentified individual. At that time, the Zodiac case had been assigned to Inspectors Kelly Carroll and Mike Maloney - two men who, by all accounts, took great care to properly investigate the case and check out many theories and suspects. Maloney even traveled to Ireland to investigate the work of one amateur codebreaker in Ireland. A book bearing the signature of a known Zodiac victim was just the kind of evidence that any competent investigator would gladly investigate. The book itself is a matter of contention. Is the signature actually that of Zodiac victim Paul Stine, is it a hoax, or did the book ever exist in the first place. Blaine’s 1986 manuscript and letters served as a window into the mind of the author. Blaine, like other theorists, reached the conclusion that he had identified the killer within months of beginning his investigation and clearly based his belief on a variety of assumptions, speculation and strained decipherings of the Zodiac’s coded messages. Like other theorists, Blaine also based much of his work on the discredited work of Robert Graysmith and the discredited claims of Darlene’s sisters, Pam and Linda. Like other theorists, Blaine seemed convinced that he had not only identified the killer but faced consequences for pursuing his investigation. Like other theorists, Blaine attributed other murders to his suspect. Yet, his report clearly demonstrated that Blaine, at that time, had no credible evidence to support his conclusions. Like other theorists, Blaine had written a massive manuscript about his theory before he had ever obtained any credible evidence to support that theory. Like other theorists, Blaine approached law enforcement with his theories, claimed he had solved the case, failed to provide any substantial or credible evidence to support his claims, and was then baffled to find that police had little interest in pursuing his theory or investigating his suspect. Like other theorists, Blaine was convinced that the evidence did not implicate his suspect and he then began the familiar cry of a cover-up and conspiracy. By the turn of the century, Richard Gaikowski was battling lung cancer and nearing the end of his life. Determined to stay active, he continued to explore his interest in computers, art, and music, and even organized a punk-rock show. A photograph reveals the aged-Gaikowski, still optimistic, still smiling, even as death descended upon him. Yet, the illness progressed and, on April 30, 2004, Richard Gaikowski took his last breath at the San Francisco Veterans Administration Medical Center. Those who mourned his death arranged to celebrate Gaikowski’s life at his San Francisco home, and friends shared memories with reporter Michael Taylor of the San Francisco Chronicle. "Richard just had a bohemian air about him," said friend Ken Tray, the executor of Gaikowski’s estate. “He was on the edge of soul.” Another friend, Jay Hanke said, “He was a hip cat... He was a beatnik." As he departed this earth, Gaikowski may have been comforted by the fact that he had lived a full life and was remembered fondly by his family and friends. The accusations of Blaine Blaine seemed long-forgotten but, when Richard Gaikowski died at the age of 68, he never suspected that his one-time-accuser would return on worldwide television to claim that Richard Gaikowski was the most notorious serial killer in American history.